If you’ve been following the latest tech news then you will already have heard about the Google Nexus 7 tablet, due for release later this month touting the new Android OS, 4.1 Jelly Bean. There’s been huge interest in this quad-core, affordable tablet and today we have details of how to purchase from Google Play and also a look at what’s inside. This 7-inch tablet will be sold through the Google Play Store with the 8GB model priced at Â£159 or $199 and the 16GB model at Â£199 or $249. For a limited time only the deal includes Â£15 or $25 to spend in the Google Play store and also some free content. Major specs and features include an NVIDIA Tegra 3 quad-core processor, 7-inch backlit IPS display with resolution of 1280 x 800, 1GB of RAM, 1.2-megapixel camera, 4326mAh battery and all running on Android 4.1 Jelly Bean. The Nexus 7 weighs 340g and dimensions are 198.5mm x 120mm x 10.45mm. To order or to find our more head to Google Play here. 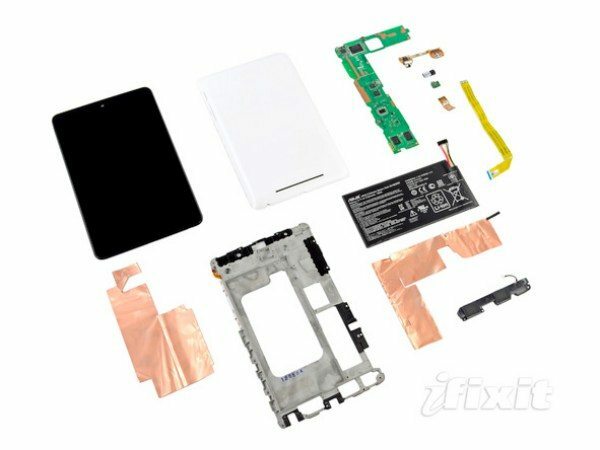 Meanwhile the intrepid team over at iFixit have been disassembling the Nexus 7 to find out more about what’s inside. As always we’d like to say we don’t recommend doing this yourselves, better to leave it to the experts. However, it’s always interesting to find out how iFixit rates the repairability of devices and on this occasion the Nexus 7 scored 7/10, not bad at all. There were plus points for the easy opening of the casing because Asus has used retaining clips rather than glue and a major factor in the Nexus 7’s favor was that the battery is easily removable without needing a screwdriver. The use of Phillips #00 screws throughout was also a plus point. One slight drawback was that the display glass and LCD were fused together so that if one component packs in you need to replace both. The battery was found to last 9 hours and 49 minutes and some of the key components on the motherboard included the NVIDIA T30L Tegra 3 processor, Hynix HTC2G83CFR DDR3 RAM, Kingston KE44B-26BN/8GB 8GB flash, Max 77612A inverting switching regulator and AzureWave AW-NH665 wireless module. Check out some of the photos of the teardown, courtesy of iFixit, to see how ingeniously the components are packed into the casing or take a look at the full teardown here. We’d like to hear your views on the Google Nexus 7. From the many posts we’ve written on the Nexus 7 we think this is going to be a smash hit, despite the fact that Nokia is currently claiming a patent infringement. Will you be ordering the Google Nexus 7 from Google Play? What are your thoughts on the teardown and the fact the battery is so easy to replace? Let us have your comments on this.